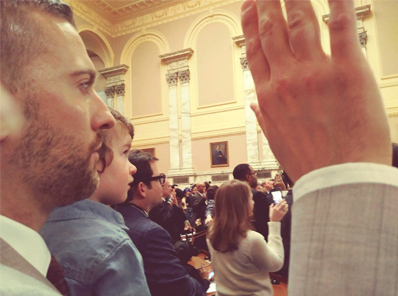 Delegate Robin Grammer Jr. swearing in ceremony with his son, Robin Grammer III. With the start of a new term and a new legislative session, I am happy to announce that I have lobbied for and achieved a reassignment to the House Judiciary Committee. This committee handles criminal and civil law, juvenile justice, public safety and family law policy. Crime is a major problem in the Baltimore region and with this reassignment I will be more effectively positioned to protect our communities. With this release, I am sharing a list of the bills I will be working on. Man-O-War Shoal Dredging Prohibition – The state of Maryland is pursuing the dredging of Man-O-War Shoal in its statutory duty to find substrate to foster the growth of our oyster populations. The state has executed dredging in the Chesapeake Bay forty years that proved to be nothing more than a temporary solution. The Man-O-War Shoal took more than a thousand years to form and it is the only resource of its kind in the Chesapeake Bay. We should not destroy our natural resources for temporary solutions. Judicial Transparency – The increase in both petty and violent crime is a massive issue for the Baltimore region. While there are many points at which the justice system can fail to protect our communities, investigative coverage of the courts has uncovered a real and continuing pattern of releasing repeat violent offenders onto our streets. I will be sponsoring several transparency bills so that the public and policy makers can find a more clear perspective on this issue. First, I will be sponsoring a bill to require that the names of judges be recorded in the Maryland Judiciary Case Search so that every person can see the name of the judge that gave an opinion or ruling on a case. Second, I will be sponsoring legislation to require cameras in the circuit courts around our state so that Marylanders can more clearly understand what is happening in our how our judicial system is ruling on criminal cases. School system reporting – My office is receiving increasing reports of school systems that are sweeping illegal activities of students under the rug. Parents and students have told stories ranging from personal violence to sexual assaults where the school doesn’t even file an incident report. I will be sponsoring legislation to require schools to file both an incident report and a police report when an assault or a felony is reported to the school administration. Teacher whistleblower protection – In private, teachers reinforce many of the concerns of students and parents. However, most teachers are terrified of blowback from the school system and very few will speak openly about what they see in the classroom. I will be sponsoring teacher whistleblower protections so that it is a punishable offense to penalize a teacher for speaking about the concerns they see in a school or classroom. Baltimore City police task force – Although there are some local jurisdictional controls, the Baltimore City Police are a state agency. At Baltimore City’s lowest point of criminal activity, the Baltimore City police force employed approximately 3,200 officers. The current force is down to around 2,300 members. This lack of manpower has is making our communities less safe and is stretching our current police force thin. I will be sponsoring legislation to investigate why the police force is not hiring to its budgeted numbers. These pieces of legislation are a few of the bills that I will be working on this session. Although it is too early to forecast the future of these bills or of any issue in the legislative session, please know that I will continue to fight to protect our communities and I will do my best to keep our communities informed about legislation during the coming session. Friends of Robin L. Grammer Jr.